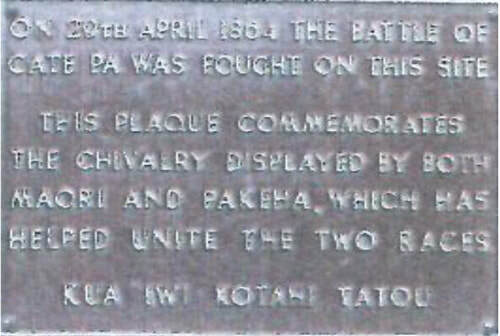 The Battle of Gate Pa (20th April, 1804) was a remarkable Maori victory achieved against tremendous odds. The battle more than any other convinced the British of the futility of assaulting a completed modern pa and undermined their will to continue the Waikato war. Gate pa was designed by Pene Taka and was perhaps the most remarkable Maori Pa ever constructed. Situated on the border of missionary and Maori land the pa stood on what is now the modern day city Tauranga. The pa consisted of two redoubts nestled between on a thin stretch of land between two swamps. The main work was 90 by 30 yards in size and the smaller redoubt was 25 yards square. The pekerangi as the drawing shows was light and flimsy. The artillery bunkers were not the large rua seen at previous pa but more numerous smaller bunkers. The bunkers relatively deep and were connected by underground passages and covered ways. 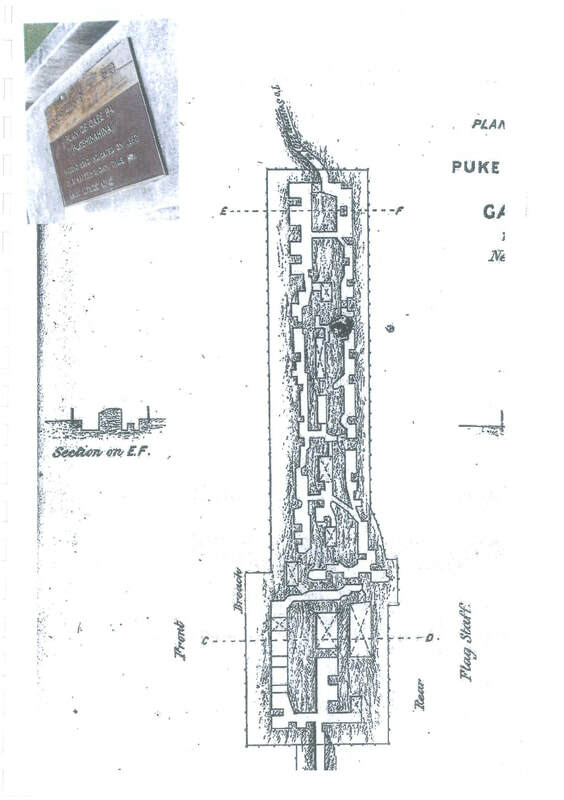 The Maori battle plan devised by Rawiri Puhirake called for a further innovative addition to the pa. This was the construction of covered shallow firing positions. These can be seen in the cross section of the pa in the resource. Loopholes in the mounds allowed the warriors to fire at will. Puhirake’s battle plan allowed his mainly Ngai Te Rangi force to defeat a British army 1700 strong. The British also assembled the largest and mostly deadly collection of artillery pieces used in the entire New Zealand Wars. Eight mortars, two howitzers, two naval cannon and five Armstrong guns were used against the pa. The artillery fired unhampered for an hour on the 28 April and for the entire next day until a breach was finally made in the main redoubt at 4pm. While some shots went straight over the pa it has been calculated 300 pounds of shot and shell fell near or on the pa for every member of the garrison. The individual rua however worked and helped to minimise Maori losses from artillery fire to fifteen. The small bunkers ensured that if a bunker was penetrated only few warriors would be killed at a time. Puhirake remained in complete control during this bombardment and effected a strategy akin to playing dead. Only occasional shots were fired from the pa to help justify what the British wanted to believe, that the garrison had been smashed by the bombardment. The pekerangi was built deliberately weak and the earthworks constructed to keep a low profile for the same reason. The Maori had a month to perfect these defences before the attack so any weakness in the fortification was looked at as intended. Keeping with this impression only a token volley by a few warriors was made from the parapets in the defence of the pa. The British storming party was allowed to occupy the pa for a few minutes before the warriors opened fire. From their concealed position the Maori decimated the confused assaulting party and after five minutes the soldiers broke ranks and ran from their invisible enemy. The British force outnumbered their Maori counterparts seven to one but British casualties to 120 killed the wounded and wounded outnumbered the Maori casualties by roughly the same number What was the smaller redoubts purpose? Unlike the main redoubt the 35 defenders of the lesser work continues firing throughout the engagement. Clearly it would have desirable to fortify the entire stretch of land between the two swamps. The garrison numbered roughly 250 half the size of the Rangiriri garrison but at only 300 yards between the swamps they only had to defend an area the third of the size of the Rangiriri line. The fact that they built a pa more proportionate to their numbers adds weight to the theory that warriors fought in the battle of Rangiriri they help man subsequent Kingite fortifications of the Waikato war and would have had ample time to discuss Rangiriris strengths and weakness. The small redoubt then served to hold the line between the main redoubt and the swamp on its side. It has to be taken into consideration that the act of allowing the soldiers into the pa was extremely that the act of allowing the soldiers into the pa was extremely risky and could easily go wrong quickly. A secondary purpose may therefore have been to provide the Maori with a backup plan. In case of the failure of the original plan the Maori could evacuate to the smaller redoubt through the underground trench connecting the two redoubts continue to fight from a position they still had complete control over.